An archive of sticky topics as posted by Vuforia moderators. Note that some links and topics may have been moved, or are no longer available. If this is the case, we apologize for the inconvenience and suggest that you search the forums to find an answer to your questions. The Hololens sample is still awaiting completion and we appreciate your patience thus far. In the interim, this post will describes some steps that can be taken to modify our Stereo Rendering sample to deploy to the Hololens. Install Unity 2017.2 and download the Vuforia Stereo Rendering for Digital Eyewear sample project from the Unity Asset Store. 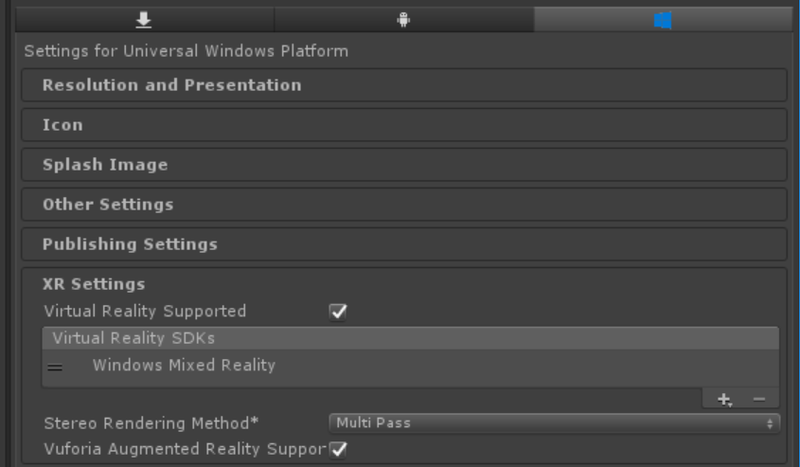 Open the Player Settings and under XR Settings, enable "Virtual Reality Supported" and make sure Windows Mixed Reality is the only SDK included. 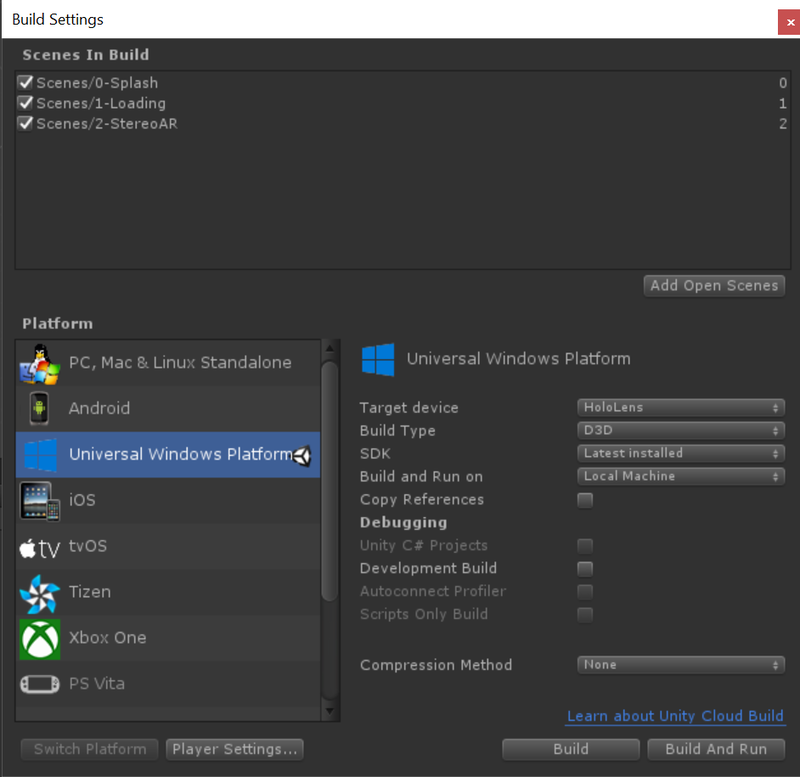 Enable "Vuforia Augmented Reality" in XR Settings as well. Open the Vuforia Configuration and set your app license. 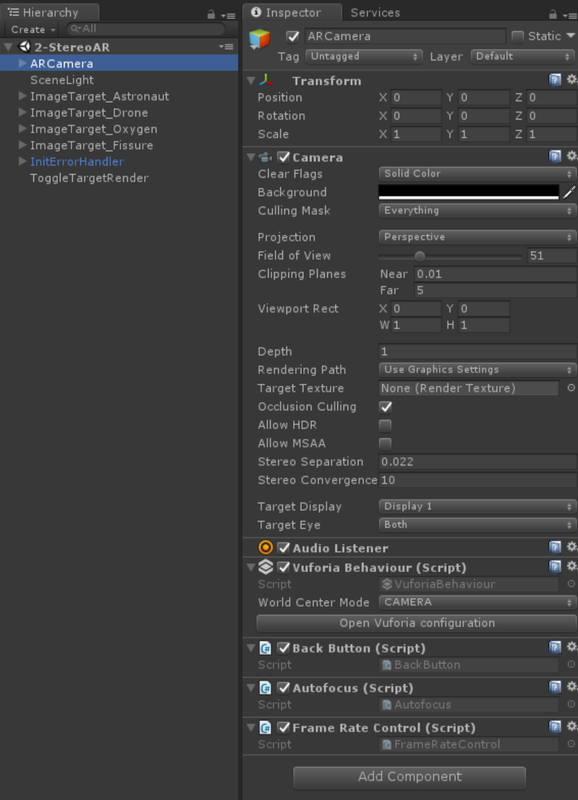 Under the Digital Eyewear section of the Vuforia Configuration, make sure "Eyewear Type" is set to "Optical See-Through" and then set "See Through Config" to "Hololens"
Select the ARCamera in your scene and set both its Position and Rotation fields to "0,0,0"
Open up build settings and set "Target Device" to "Hololens"
Attached are some screenshots of the various settings needed. Please let me know if you have any further questions.